This is probably the best blueberry cereal I've ever tried. While there's not as many "wild blueberry clusters" as the box would have you believe, the authentic taste of blueberry permeates the entire cereal. Even in spoonfuls without clusters, you know you're eating a blueberry cereal. The oat flakes are crunchy and have a kiss of honey and vanilla. Eaten by themselves, their taste reminds me of a quality blueberry muffin batter. If you've ever made really great blueberry muffins and licked the spoon, you know what I'm talking about. As for the nutritional profile, this is a respectable cereal. The claims made on the box are little over the top. For instance, it claims that it "promotes healthy blood pressure" because it's low in sodium. The same could be said of water and popsicles. Each 1 and 1/4 cup serving has 200 calories, 0.5 grams of saturated fat, 0 trans fat and 4 grams of soluble fiber. It's vitamin content shows a couple nice surprises. Each serving has 100% of the Daily Value for Vitamin B6, Vitamin B12, Vitamin E and Folic Acid, plus 50% of the Daily Value for Vitamin C.
The bottom line is that this is a great cereal. There's no feeling that your compromising taste for health benefits. It tastes hearty and pleasantly sweet with a real flavor of blueberries. This cereal is very highly recommended. What do you think of Heart To Heart With Wild Blueberry Clusters? I agree that the blueberry taste is authentic. 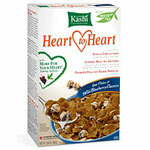 This is the best Kashi cereal I have tasted and one of my favorites of all the cereals I eat. It tastes particularly good with Vanilla Almond Milk. 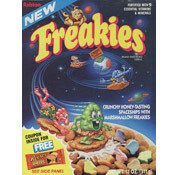 I also loved this cereal -- and wrote Kashi to tell them so! Not only is it delicious, it has a great nutritional profile as well.